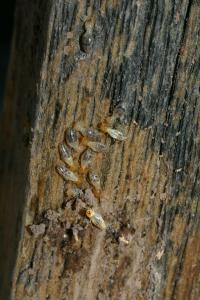 Termites are one of a homeowner's worst nightmares. Hidden away in the walls of your house, they can slowly destroy the wooden infrastructure of a home, causing extensive damage before you even realize they are there. Fortunately, no matter how severe the infestation, there are treatment methods available, though the help of a professional is almost always required. One of the most common approaches taken by pest control companies is to drench the soil around the home with a chemical repellent. Any termites that come into contact with it will be turned away, taking care of existing infestations and preventing new ones. The repellent has to be reapplied every few years. The downside of this approach is that it is difficult, even for trained professionals, to block every area of the house using the chemical repellent. One small gap of untreated soil can then be a vector for the termites to enter. Areas where there are large trees are other objects adjacent to the house, such as air conditioning units, are particularly problematic. However, using special tools and regulated chemical products, professionals have a variety of means at their disposal, such as foams that seep far into the soil, blowing chemical powders into crevices in the foundation and even drilling into the soil from basement to apply the chemicals. This term refers to any pesticide designed specifically for termites, which are applied in a similar manner to the repellents by professionals. 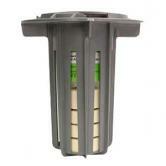 The main difference is that termiticides are designed to kill the termites, rather than repel them. 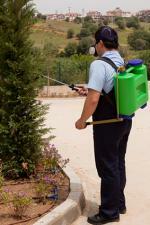 These do not last as long in the soil as repellents and are commonly used to treat a single area that is badly infested. This is the main option available for the do-it-yourselfer, although licensed professionals will have many other products available for their use compared to what can be found in a home improvement store. The purpose of a bait station is to attract the 'worker' termites who will then carry the toxic bait back to the nest and share it with the rest of the colony, causing it to collapse. The stations are essentially small round canisters that are inserted into the soil every eight to 10 feet around the perimeter of the home. Some bait stations are also designed as monitoring stations, using an attractant as a means to determine if termites are active in the area. Many pest control companies offer the service to come out and check the stations on a monthly basis to determine if treatment is necessary. If the presence of termites is discovered, the attractant in the bait station is simply replaced with a type of termiticide that will be carried back to the nest. The only downside is they are not always 100 percent effective in attracting any termites that may be in the area, though if they are spaced closely enough they are usually effective. This approach is only used for severe infestations, as it is very costly and disruptive to life at home. If you've seen house with what appears to be a giant rubber tent completely surrounding it, this is a home that is being fumigated. Toxic chemicals are pumped continually into the inflated 'tent' for several days as a method to exterminate termites that have penetrated deeply into the wooden structures of the house. 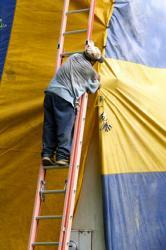 Fumigation is considered a last resort. Increasingly, bait stations monitored by professional treatment companies are the tool of choice for preventing and treating termite infestations. Pest control companies charge a monthly fee for the service, but having them on-site regularly means that they can spot a problem before it is out-of-control. They will often recommend a customized treatment plan, based on the unique circumstances of the infestation - different species of termites, soil conditions, and construction styles may all impact the treatment plan, for example. The bait station monitoring service is generally more expensive over the long run than having someone come out and do a soil drench every few years. However, drenching the soil with insecticides has major environmental downsides and is often undesirable for people who have pets and children that use the yard for play. If you are determined to do it yourself, try one of the bait stations available at home improvement centers - this is by far the cheapest option. But keep in mind that the most effective chemicals are not available for the general public to use and the most effective methods of administering them are not feasible for the average homeowner because of the specialized tools, equipment and knowledge that are required. The best form of termite treatment is prevention. Building with wood that is treated with a termite repellent, installing a physical termite barrier around the foundation and, at the least, making sure to never pile woody debris or soil adjacent to the house goes a long way toward never having to deal with a termite invasion.